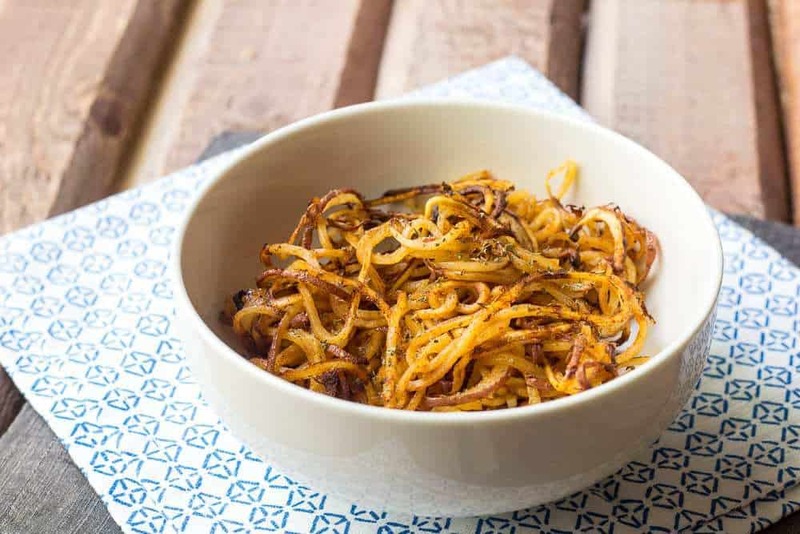 Spicy spiralized potatoes make the common spud exciting again. This post is brought to you thanks to OXO. Growing up in the Midwest in the ’80s and ’90s meant that when it came to dinner sides, potatoes were our go-to. Mashed, gratin, tots … they were all frequent visitors to the table. As a result, I love potatoes — but I also get sick of them pretty quickly. Figuring out a way to serve them that was more than the same old, same old always felt like a challenge. I do love these fantastic roasted breakfast potatoes, but they take a bit more preparation time than I can usually handle for dinner. And my loaded skillet potatoes? Well, I can’t be making those every day. Enter the spiralizer. Now, I know everyone is jumping on the spiralizing train, and yep, I am too. I’ve actually been preparing my vegetables this way for a few months, but I’ll admit I purchased a cheapy version on Amazon, and the results were not very pretty. I’d get a few lovely strands, but mangle the rest of the zucchini, and if I tried to do anything harder than a cucumber I’d manage to cut my fingers and break the vegetable. Just when I was about to give up on the whole trend, I found out that OXO was releasing their very own Hand-Held Spiralizer. Those of you with counter space that you just seem to fill up no matter what will rejoice with me. As soon as it arrived, I made a batch of zoodles and posted the video on Instagram. No more broken zucchini! No more sliced skin! Then I put it to the test on harder material: potatoes. Lo and behold, it worked perfectly there as well. I might have been dancing in my kitchen at this point. I have lots of plans for the rest of the potatoes on my counter, but for this batch I created some wonderfully spicy potatoes that are really addictive. As you cook the potatoes, you get some crispy bits and some bits that are perfectly melty — kind of like both the interior and exterior of a French fry. I seasoned them with my favorite, smoked paprika, as well as chipotle chile powder and garlic powder. For less heat, try cayenne powder instead, or simply reduce the amount. This recipe uses one pound of potatoes (I recommend a variety like Red Gold or Yukon Gold), which is just slightly less than 4 moderate-size servings. However, you’ll find these potato strings will get gobbled up quickly, so consider making a double batch! When choosing your potato, be sure it is not too large in diameter to fit into the spiralizer. You can trim away any excess potato to get it to fit, but it’s easier to just buy potatoes that will work with the dimensions. Also, I didn’t bother to peel my potatoes. Not only does this retain some key nutrients and fiber, but also the more-textured surface will make it easier to grip the potato as you work it through the spiralizer. After the potatoes are done cooking, I tossed some oregano on top. Try it that way, or with grated cheese! Preheat oven to 425°F and line a baking sheet with a Silpat or parchment paper. Wash potatoes and pat dry. Trim a small piece off the top and bottom of the potato. Insert one end of the potato into the spiralizer, lining up the center, and twist to create spirals, letting the spirals fall into a large bowl. When you get near the end of the potato, insert spiralizer top into potato to avoid cutting fingers while finishing the cuts. Repeat with remaining potatoes. Whisk together olive oil and honey and toss with potatoes. In a small bowl, mix together paprika, chile powder, salt, and garlic powder. Scatter mixture over potatoes and stir to combine well, making sure the potatoes are evenly coated. Spread potatoes on prepared baking sheet. If you like, cut spirals into smaller lengths. Bake for 15 minutes. Sprinkle with oregano and serve immediately. Disclaimer: I received the OXO Hand-Held Spiralizer for the purpose of review. I was not otherwise compensated and all opinions are my own. For more meatless inspiration, check out my Vegetarian board on Pinterest! Follow Megan Myers | Stetted’s board Vegetarian on Pinterest. I bought my table top sprializer last year and used it just once. You’ve inspired me to dig it out. Of course zucchini noodles didn’t inspire me all year (what I made) but you mention potato and I’m like, YAS OKAY!